This car park is perfect for shorter trips and weekend breaks. Located a short walk from the terminal building you can skip to the transfer bus and stroll straight to the check-in desks. 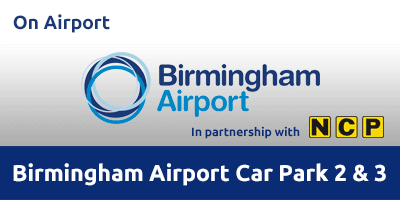 This is a quick and easy way to park at Birmingham Airport and offers great value for all types of traveller. With just a short stroll to the terminal, there’s no need for airport transfers. Car Park 2 & 3 features CCTV, 24-hour staff and have been awarded the Park Mark Safer Parking Award; so you can be worry free knowing that your car is being well looked after. Disabled spaces are available for Blue Badge holders, however they are limited. Press the intercom button at the barrier for any assistance. Birmingham Airport Car Park 2 & 3 is open all year round, 24 hours a day. Follow signs to the airport. On arrival at the airport, follow the signs for Car Park 2 & 3. Drive up to the barrier where automatic number plate recognition is in place and a ticket will be issued automatically. Drive through and park in a vacant space. Grab your bags, your keys and take the short walk to the terminal building. Keep your ticket safe as you may need it to leave the car park on your return. Walk back to the car park. Drive up to the exit barrier and insert your ticket. The barrier will rise and you’ll be on your way.